Goodbye Arthur Boothroyd | Me fail? I fly! 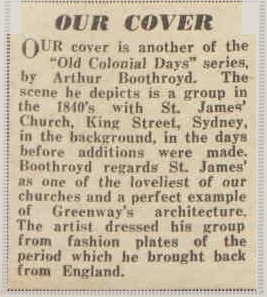 I posted about Arthur Boothroyd’s hundredth birthday last October. A lifelong friend of Arthur’s who lives in Switzerland just broke the news to me in a comment on that blog entry that Arthur has died. It happened on 10 February, and the funeral was last Tuesday, 15 February. I’m very sorry to have missed it. He was a gracious presence in Annandale, and created a good bit of the visual environment for generations of Australians. This entry was posted in Around Annandale and tagged art, Arthur Boothroyd, Australian Women's Weekly. Bookmark the permalink. Thanks for posting that. Haven’t seen it before. If you’d like a copy of Uncle Arthur’s funeral service, which has a few photos of him and a sketch, send me your details. Thanks, Cathy. I’d love a copy — I’ll email you. 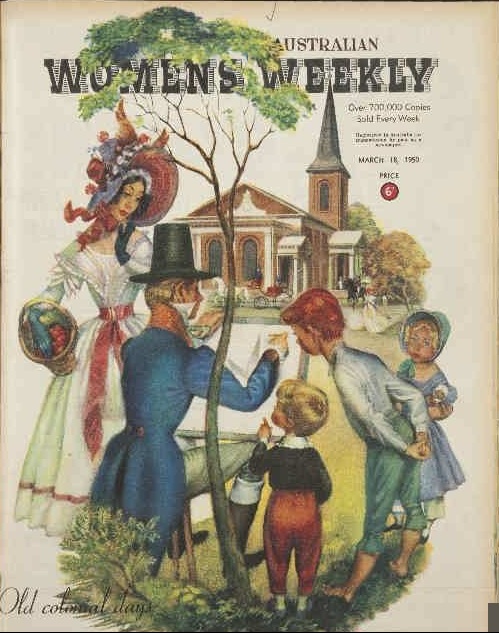 There’s a project under way to digitise the Womens Weekly archives. A lot of Arthur’s work is now available on line at the National Library thanks to that project.